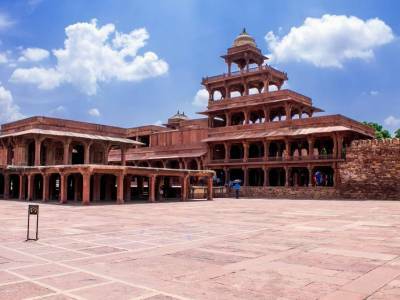 Panch Mahal, also known as “Bagdir” and “THE DREAM OF STONES” is a five-storey entirely columnar palace in Fatehpur Sikri in the state of Uttar Pradesh, India. It is supposed that the palace was a place for relaxation and entertainment. 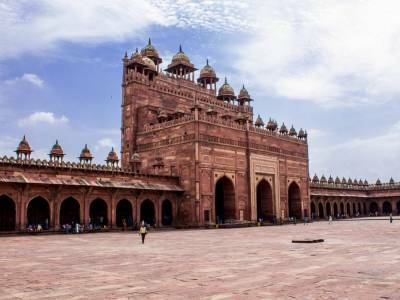 There is no denying that this building in Fatehpur Sikri is right there at the top in terms of importance and it is also by far the tallest building in Fatehpur Sikri. The structure is quite majestic and extraordinary. There is a mind-blowing sight of the fort lying on the left from the pavilion. 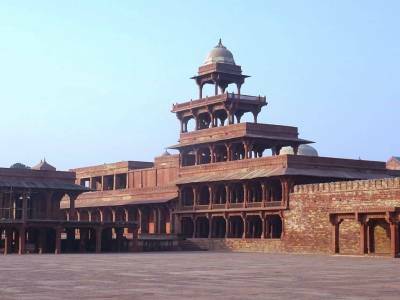 There is a pool which is placed in front of the palace and is known as Anoop Talab which used to be entirely filled with water acting as an ideal venue for musical concerts and other sorts of entertainment during the reign of the great Mughal emperor Akbar. The ground floor, first storey, second storey, third storey and the fourth or the final storey has 84 columns, 56 columns, 20 columns, 12 columns and 4 columns respectively which make a total of 176 columns. There is a chhattri in the topmost storey which is supported by the 4 columns. All the columns are intricately designed with great elegance and are unique. The 84 columns in the ground floor act as a super support for the whole structure. The Panch Mahal is open for tourists and travelers everyday from sunrise to sunset. The architectural class finds some of its highest expression in this beautiful and historic palace of Panch Mahal. 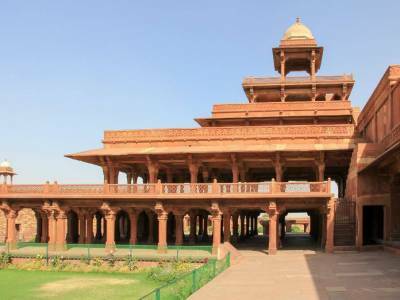 The construction of the Panch Mahal was made in a way that it was able to provide some sort of respite from the scorching summer heat and thus be an ideal seat of relaxation for the king. 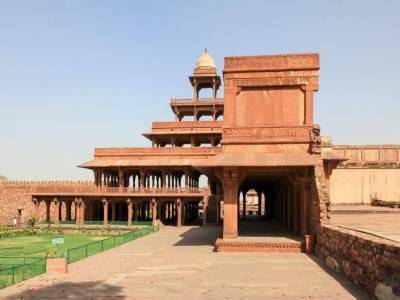 The Panch Mahal is a must visit for any and every traveller visiting Fatehpur Sikri. Get quick answers from travelers who visit to Panch Mahal.